Chinese tofu vegetarian stir fry is one of the easiest vegetarian recipes you can make. It's great for a family get-together because it can be enjoyed by vegans, vegetarians and meat eaters, and will likely attract little complaint. All the recipe calls for is extra firm tofu, soy sauce, olive oil and your choice of vegetables. This recipe is not appropriate for those on the raw food diet. Vegetables that are appropriate for this dish include mushrooms, peppers, broccoli, carrots, baby corn, snow peas, onions, bok choy and water chestnuts. Some also like to include tomatoes and pineapple to make the stir fry taste a little sweeter. This recipe only takes a few minutes to cook. Most of the time needed is for preparation. The first thing someone looking to make this dish needs to do is take the tofu cube out of its box and lay it between two paper towels. Set something heavy on top of it and let it sit overnight. This will get all of the excess water out of the tofu and prevent it from getting soggy. Once that's done, the tofu needs to marinate in a mixture of soy sauce and lemon juice (three tablespoons of soy sauce to one tablespoon of lemon juice) or a premade teriyaki sauce. The easiest thing to do is put the tofu in a shallow dish and pour the liquid on top of it, adding more liquid as needed to cover the cube. Next comes chopping the vegetables. They work best in the stir fry if they are cut to about a half inch in size, since it makes it easier to cook them evenly. Of course, small vegetables, such as baby carrots or baby corn, may not need to be cut up. 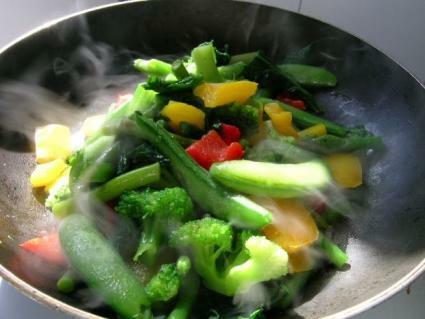 It's also okay to use frozen vegetables since most of the water will evaporate during the cooking process. Pour a quarter cup of oil into the wok and turn it to high heat. Cut the tofu into half inch cubes and add it to the wok. Stir the tofu and begin adding the vegetables one by one. Keep stirring so the vegetables don't burn. Pour in the marinade used for the tofu and continue cooking until the vegetables are tender. It usually takes about 10 minutes, but could take more or less depending on the wok. This stir fry tastes wonderful on top of a bed of rice, but it also good on its own. Adding a tablespoon of fresh ginger will give it a slightly tangier taste that many enjoy. There are dozens of variations on the Chinese Tofu Vegetarian Stir Fry recipe. Many can be found on the International Vegetarian Union's website. There's also nothing wrong with getting creative with a signature dish. After all, every recipe was just a part of someone's imagination at some point. It can often be a problem for vegetarians and vegans to find a lot of promising menu options at restaurants. One thing they can do at most places that sell Asian food is ask the chef to create a vegetarian stir fry for them. Most likely they will already have all of the ingredients since they are popular in many different dishes of the region. It also won't take the cook a lot of time, since the tofu and veggies should already be prepared.